After finally stumbling across this site and noticing that there was no write up or set list posted for this show at the Selland Arena in Fresno, California, I decided to pull out the tape I made that night and compare it to the shows that have been posted. The set list is exactly the same as the show in Reno, two nights prior to the Fresno show, with the exception of the order swapping of "Big Generator"(4) & "Changes"(5). After reviewing the recording, I remember being particularly struck by the song "Shoot High Aim Low". It was probably my favorite song performed that evening. I also have The BIG Tour, concert program & an un-torn ticket. 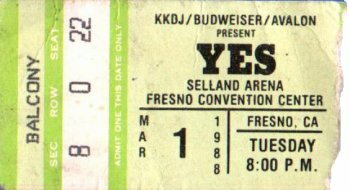 This was the 3rd YES show I had attended at the Selland Arena, the other two having occurred in 74 & 76. Now, if someone will direct me to the proper procedure of delivering this COMPLETE, nearly perfect recording, to whoever is in charge of getting it made available to YES fans & properly archived, please contact me at: sonicwizdj@gmail.com I will be more than happy to donate it if appropriate credit is posted.